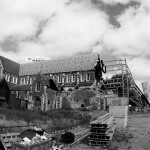 I owe more than half my adult life to Christchurch, and I have many friends and family still residing there. It’s difficult to describe what it felt like to see it in this state. Hopefully these pictures tell at least some of the story. 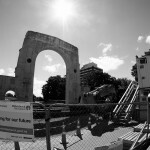 The ruins of Christchurch Cathedral. 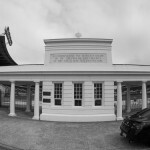 It was once the main landmark of the CBD, and its barely-standing ruins are an emotional sight. 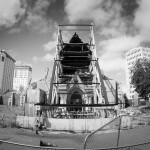 From the side you can better see the steel frame that was erected to stabilise the front of the cathedral after the first quake. 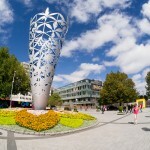 The Chalice sculpture in Cathedral Square in Christchurch happily survived the earthquakes. The flowers at the base are a post-quake addition. 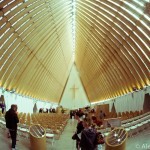 The “Cardboard Cathedral” is the temporary home of the Anglican Church, which was displaced when the original cathedral was destroyed. 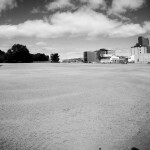 This empty lot backs onto Latimer Square and used to be full of buildings. 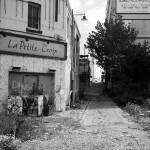 This was the eastern alleyway entrace to Sol Square, which was the main nighclub hotspot when I lived there. 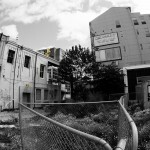 Yellow Cross was never visible from the road, all the empy space in front used to be commercial real estate. 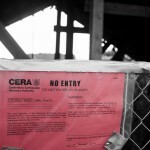 Warning signs from the Canterbury Earthquake Recovery Authority are depressingly common. 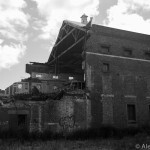 AMI Stadium (known previously as Jade Stadium and before that Lancaster Park), was sadly ruined in the quakes. 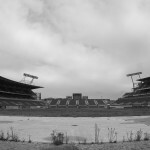 This shot is looking right at where the Hadlee Stand once stood. 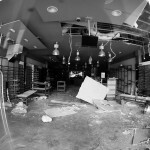 The interior of a condemned retail shoe shop. Shooters was a popular bar, and alongside it was Boogie Nights, a disco themed night club. 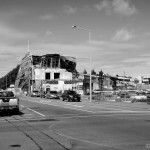 I’m not sure if Boogie Nights was still running at the time of the quake, it had become less popular over the years. 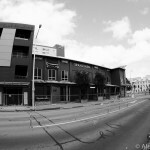 The Strip, on Oxford Terrace between Cashel St and Hereford St, used to be one of the liveliest bar areas in Christchurch. 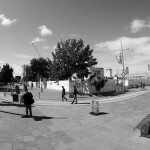 The Bridge of Rememberance survived, but requires some work to make it safe again. 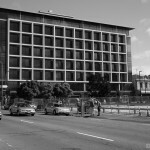 A contrast between the state of building design in 2007 vs 1986 – despite having been condemned the IRD building pictured here looks pristine from the outside. The CTV building, which occupied the lot opposite, killed 115 people when it collapsed on February 22nd. 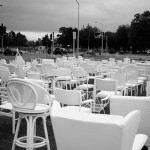 One chair for each victim of the quake. Many of them died in the collapse of the CTV building, which once stood in the empty lot diagonally opposite. 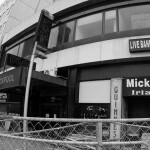 The site is being made into a memorial.